Hi there folks! 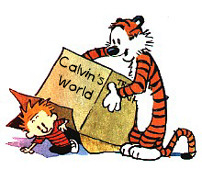 Calvin's World has just been updated! It's been quite a while, sorry...we've been very busy. Anyway, what makes this page different? Well, the entire homepage is in the process of being revamped for easier navigation. We're trying to eliminate dead links and most importantly, we're adding new pictures and a brand new gallery! Anyway, to those who have come back to check out what's new, you've come at the right time. There's also a current promo going on. 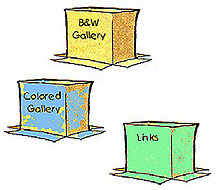 Calvin and Hobbes name tags will be given to the 2000th and 2500th visitor of this homepage! 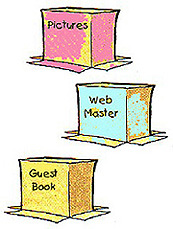 Fore more details, go to the webmaster's page. To those of you who are here for the first time, welcome! Oooops, one last thing, if you want to download pictures, please remember that everything here belongs to Bill Watterson, creator of Calvin and Hobbes. Visit the readme portion in the webmaster's page before downloading any pics. Thanks and please sign in the guestbook. You are visitor number !